Guest Blogger: John Thomas, Writer/Strategist, JTPR, Inc. Nonprofit organizations do amazing things. Things like curing diseases … feeding people … making art accessible to the masses … helping communities come together and fight injustice. Unfortunately, some organizations that do those amazing things wither and die, not because they fail to perform, but because they fail to get their messages out to the people they need to receive them. Whether they’re trying to raise money or engage people in their mission, they fail to connect with the right people. As you consider that statement, note what I didn’t say: I didn’t say these lost organizations didn’t send messages. They probably sent a lot of messages. But they didn’t send them effectively. Nonprofits find innumerable ways to drop the ball on communicating, but most of those fumbles can be attributed to a few consistent mistakes. Following are a half-dozen of the most common failures, and some quick cures that can help your organization communicate more effectively. The failure to send a concise message. If you haven’t boiled your message down to its essence, you need to keep boiling. The classic “elevator speech” concept is a good guide, but elevator rides seem to be getting shorter and shorter. Here’s a better guide: Boil that message into an old 140-character Tweet. When you can do that, you’ve got a clear, concise and simple message. The failure to know what you’re trying to make happen. Sure, you have organizational objectives, but do you know what you’re truly trying to make happen with a particular communication? Ask yourself, “What do I want people to physically do when they get my message?” Pick up the phone? Write a check? Go to my website? Figure out what you want people to literally do and you’ll sharpen your objective. The failure to define a target audience. Yes, your message is so wonderful it should be received by everyone who ever walked this green earth. Unfortunately, that’s not possible, no matter how much you have to spend on marketing. Zero in on those people who can truly make a difference, identifying them as specifically as possible, and then communicate as directly as possible. The failure to let the message rise above the data. Yes, measurable results and hard data help you make your case, but more data doesn’t help you make your point more effectively. On the contrary; numbers can be numbing. If your message is obscured by metrics, your audience won’t engage with it. Choose the two or three data points that reinforce your messages, and drop the others. Remember: You’re not communicating to impress. You’re not communicating to assert your importance. You’re communicating to send a message that moves audiences to action. And if you fail to do that, eventually, you’ll fail as an organization. John Thomas is co-owner of JTPR Inc., an Indianapolis-based public relations firm that works with nonprofit and for-profit organizations to deliver messages that move people to action. 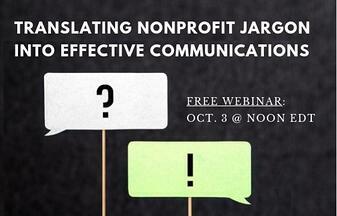 On Oct. 3, he’ll join Angela White of Johnson, Grossnickle and Associates for the webinar, “Translating Nonprofit Jargon into Effective Communications. Register here. Sometimes the nonprofit world speaks with so much jargon that it can almost seem like it has its own language. The problem is we often get so wrapped up in our world that we forget to “translate” our language when we’re communicating with the audiences we most need to reach: donors and influencers. We’ll share real-world examples and practical tips that will help you speak and write more clearly and effectively. • John Thomas, Writer/Strategist, with communications firm JTPR, Inc.